CardCash customers use pre-owned discounted gift cards to save you money on everything they buy. We offer a 100% guarantee that every gift card you purchase from CardCash will be valid at the merchant and for the dollar amount specified on your order for a full 45 days from the date of purchase. If you encounter a card with a balance discrepancy within 45 days of your purchase, contact us immediately for a full refund. Unlike a carton of milk past its expiration date, gift cards do not go bad all by themselves. The two most common reasons gift cards lose their balance are: (1) The card was purchased with a stolen credit card and subsequently canceled by the issuing company. (2) The original owner used the card number after selling it to CardCash. Use the full balance of the card within 45 days of the purchase. IMPORTANT! 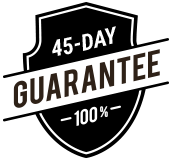 Even if you checked the balance and it was fine within 45 days, the guarantee expires at 45 days from your purchase date. All you need to do is use the card within 45 days. We employ the industry’s best anti fraud procedures to do whatever we can to prevent this from happening. Of course, we can’t share all of the steps we take with you, but they always include vetting anyone who sells us gift cards, match patterns against our advanced fraud detection algorithms as well as verifying each gift card balances multiple times. In order to make the CardCash experience the best is can be for both buyers and sellers, we maintain the highest security standards and have a zero tolerance policy for fraudulent activity. We reserve the right to suspend or cancel the registration of any Buyer or Seller who we believe, in our sole discretion, abuses or attempts to abuse the CardCash Gift Card Guarantee. We will report any such abuse to the appropriate legal authorities.